Laboratoire Matière et Systèmes Complexes - Séminaire MSC. 17 mai 2018. Isabelle Cantat (IPR, Rennes) :" Hydrodynamics in foam films." Accueil du site > Séminaires > Archives séminaires > Séminaires 2018 > Séminaire MSC. 17 mai 2018. Isabelle Cantat (IPR, Rennes) :" Hydrodynamics in foam films.". Attention horaire exceptionnel ! Jeudi 17 mai à 11h30 en salle 454 A. The drainage of vertical foam films governs their lifetime. For a foam film supported on a rectangular solid frame, when the interface presents a low resistance to shear, the drainage dynamics involves a complex flow pattern at the film scale, leading to a drainage time proportional to the frame width. 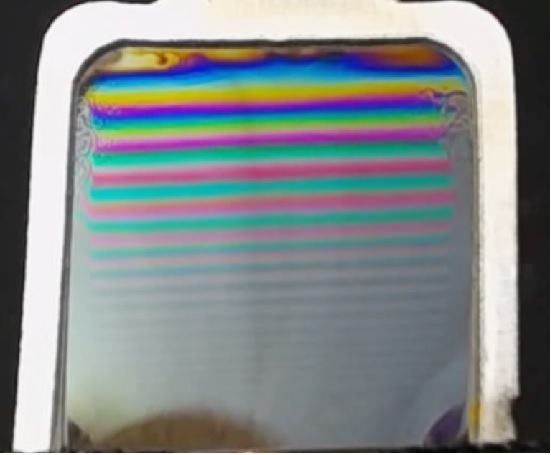 Using an original velocimetry technique, based on fluorescent foam films and photobleaching, we measure the horizontal and vertical components of the velocity in a draining film. Upward velocities up to 10 cm/s are measured close to the lateral menisci, whereas a slower velocity field is obtained in the center of the film, with comparable downwards and horizontal components. Scaling laws are proposed for all characteristic velocities, coupling gravitational effects, and capillary suction.